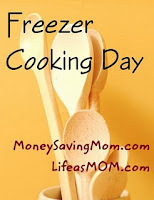 This month, we are joining Life As Mom and Money Saving Mom for Freezer Cooking Day. The BIG day for me will be this Thursday but I will try to spread it out the whole week to avoid "freezer burn-out". Instead of coming up with different weekly menus, I drafted a generic weekly plan to stay flexible. I'm praying this works so I can get a break from "What are we having for dinner?" queries. Of course I'm linking to OrgJunkie for MPM and I found at least 5 new recipes I want to try already! And since I'm praying this monthly menu planning becomes habit, I'm linking to Mommy's Kitchen as well. It's too bad I can't stand leftovers. But that is why I think this will work. Instead of leftovers, we can eat just enough for that meal and have the rest frozen for the following week! The other dishes will be whipped up same day. I'm motivated to get this done not only to get out of the kitchen the rest of the month but also to save money while cutting down on waste. Do you do once-a-month cooking or have freezer cooking days? Pass along your best tips. I could sure use them! My computer went down but not before I promised you regular Weds posts on grocery deals. Funny how things work out. But at least I have some pictures to share as well. 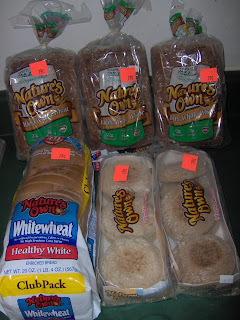 Don't forget about the local bread thrift store. Most cities have one. I spent $5.24 on everything here including pecan pinwheels for $0.50 not pictured here. Each item here was only $0.79 each! They only had 3 packages of Organic 100% Whole Wheat and I got all of them. Their specials change daily so call ahead. (850) 944-9989 in Pensacola. Publix, how I love thee! All this for $29. Lots of BOGO too. Check out IHeartPublix for deals. All of these items are FREE or very, very cheap! I'll list out the deals later for you. Welcome Company Girls! While it's evening here now, I still put on a pot of coffee. The gentle pitter-patter of rain outside just calls for it! Today I did laundry and got reacquainted with the lint remover. Some black socks came out spotted with white fuzz. Does that happen to you? Hubby was sick and left some tissue in his jean pockets. As I rolled the lint remover over 12 socks back and forth, I was surprised with calm that came over me. I got these lint removers free a while back and thinking of freebies makes me happy. BTW, that's my Frugal Friday tip: be on the look-out for freebies. Every week I get something for free. This week it was toilet paper, paper towels and post-it notes. Pair a few coupons with a sale, voila! Instant frugal. It's easy to find freebies at Target, Publix, and Wal-Mart, too. Now you know how easily amused I get. On a more serious note, flu season hit my laptop. Not too long ago, I cleaned out a virus. And this week it got two at the same time! Thankfully, all my docs and pics were saved from the last incident. I had to reboot the whole system. But what I forgot to copy was all the addresses of my bookmarked favorites! Oh well. At least I got to spend more time with family. Just this Tuesday, hubby and I stayed up til the wee hours of the night talking while he worked out and I clipped coupons. Just like college days when no sleep was routine. We've only had one overnight trip away from the kids when we went to Monterey, CA. Since living in the Gulf Coast, I've forgotten how wonderful it is being engulfed by mountains. The crisp air and cool nights was a relief that summer. 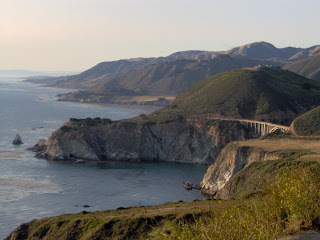 Except for when I thought we'd fall off the mountain and die driving Big Sur, it was a perfect trip! Even though I can't wait to get away there again, being able to reconnect with my husband when the kids are asleep this week has filled up my emotional tank. Having no agenda except to share and dream together is truly a Fine Thing. Have a wonderful weekend, everyone! Enjoy the link love. I hope you will visit other sites I've listed here. The fellowship is unsurpassed at Company Girl Coffee. Frugal Fridays is filled with inspiringly economical tips. Finer Things Friday keeps me motivated to stay positive. 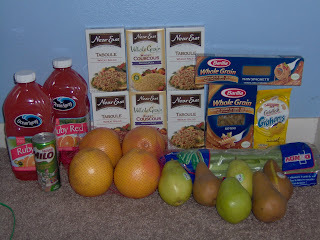 Starting this Weds you'll see grocery deals in Pensacola posted regularly. But with a twist. I was all over the place before w/ posting individual store deals. And 1)it's way too much work, 2)not how I shop anyway. Instead, I'll post the very best deals (like ones I would buy myself) and also price-match deals at Wal-Mart and Target. So, brush up on your price-matching skills! Later, I'll start a price book page. So if you find something on sale but need to know if you should stock-up or not, you'll be able to go to the price book page to find out if the price is right. I hope these changes will help you out. Also, I'll add links to blogs that list other stores for out-of-town friends! This post is linked to orgjunkie. Check out the hundreds of other menus to inspire you! We are still eating mostly from the pantry, especially with our meats. I got away with barely cooking anything until this weekend. It's been nice to get a break out of the kitchen. Dinners for the next few days have already been prepared. All I need to do is serve rice or couscous, plus a generous salad. For dessert, we're having Blue Bell frozen yogurt. I couldn't resist at only $3.99 (price-matched). So I was thinking of getting some pears and apples to bake and serving these with the "ice cream". Did you know there's a 70 calorie difference between frozen yogurt and the real thing? And the fat content is incredibly more for ice cream. No wonder I chose to live a life of bliss and avoid reading the nutrition labels. Sometimes, the truth hurts a lot! The last day to do the Olay Regenerist Rebate is TODAY, Jan 24. Just in time, too, if you haven't sent it in yet. 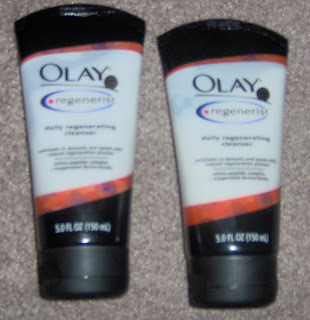 The gist of the Rebate is Buy any 2 Olay Regenerist, get a $15 Rebate Check by mail. Target has the 5oz for $5.49 each starting today, Sunday. So hurry and get it. I hope this convinces you Rebates are worth the time! Thanks to Iheart Saving Money. Her Rebates Page is so easy to read! There are lots of good rebates listed that you can still do. *I tried to do this last week at CVS but the manager was off that day and the $5 sale ad I saw was already changed to $6.99 (overnight!) so I just returned them. But, God is so loving and doting. Target's deal is just as great. I'm getting these today at Wal-Mart to price-match just in case Target runs out. If you only have one PG insert, there are two Q's you can use: $3 off Regenerist & $1 off facial moisturizer. What follows is a rant about my Target trip that hopefully has underlying value and some coupon lesson you can learn. Today was the last day to price-match Big Lots for $2.50 All detergent. So I did my usual stop at Customer Service. I know they already know me. Yet, I still got a hard time about price-matching. Apparently, unbeknownst to me, if the ad says: Buy 2/$4, they expect you to buy 2! And the Big Lots ad had a microcsopic note "$3 for 1" under 2/$5. So I'm calculating in my head because I only printed one coupon (should have known better!) and will lose that *gasp* dollar of savings. I caved in because we are down to one bottle of detergent and the laundry monster has come to visit. While hubby fetched the other bottle, I price-matched Publix's 2/$4 deal on Eggland's Best eggs. They gave me that look, "Where's the other eggs?" Completely burst the bubble I was in- I was just feeling good buying those pricey eggs, and with a coupon to boot! "I can buy these at Publix if you won't sell me just one," said I, trying not to roll my eyes. It's been so long since I've had to deal with someone making you get the EXACT deal on the ad. Common knowledge is: if it's 10 for $10, you can buy 1 and still get it for a $1. If it's 2/$4, you can get one for $2. That's been my experience everywhere. C'mon Target, get on the ball! Check it out! Great news for all you NEX and Commissary shoppers. I came away with my pride and dignity back, plus a great new blog to bookmark. Seeing the lighter side of mishaps is, for sure, the best way to keep going on this frugal journey! My brain is all loopy right now so I couldn't make any sense of the CVS and Walgreens ads. But it's better to wait a couple of days anyway and check what extra deals and match-ups other bloggers find. Unless, of course, they have FREE after ECBs or RRs then I always do those ASAP (Sunday or Monday at the latest). I don't text, but with all these abbreviations, I sure feel 10 yrs younger! Visit IheartCVS for Ad Scans & Hip2Save for match-ups. Visit IheartWAGS for Ad Scans and IheartSavingMoney for match-ups. Kerry at Totally Target has Sneak Peek Ads ready by Saturday. Visit Target.com to see the ads. Well, it's still Friday. But what the hey... I'm on a roll. I did a lot more grocery shopping this week than I intended. 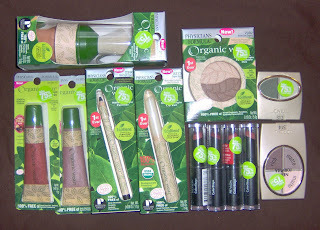 Mostly to stock-up on some items and to get some rebates sent in. Publix, I love your BOGO sales! But I didn't realize that IHeartPublix and I have different prices (she's in Atlanta where it's cheaper). All the same, still great deals, spent only $22, saved $32! Plus grapefruit is FREE with the drinks. Since this pantry challenge started, mine has been to eat what I buy. So the goal is to finish off all the fruits and veggies before buying more. Waste not, that is my challenge! Walgreens was a friend to me. Spent $39, got $24 RRs back. I had lots of RRs expiring so it was nice to find deals to use them on. Plus, there's a $10 Rebate that I'm doing too. CVS- Thanks for letting me branch out in make-up. I've never used Physician's Formula before, much less their organics. 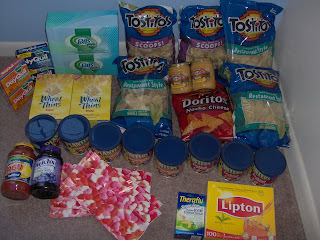 Spent $0.14 on all this stuff! Went back for more, of course. These were 75% off (look or the green dots) and then I used my ECBs to cover the rest. I also bought all the SoyJoy I could muster (FREE after ECBs) and made some early Valentine's gifts for some friends in our MOPs group. 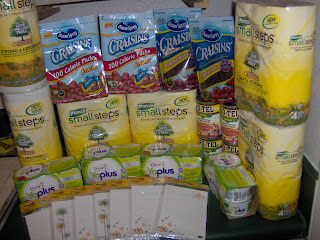 I called them Mommy-To-Go packs with Dove chocolates, SoyJoys bars, Crystal Light and Folgers Instant Coffee sticks. 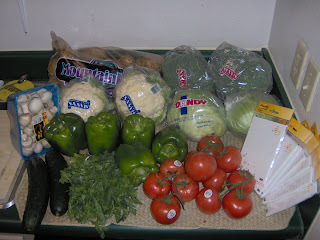 I also went to Wal-Mart and price-matched enough produce for the week, spent only $10 there. And I stopped by Winn-Dixie because we were so, so hungry and didn't pack lunch. Bought a $5 sub to split and spent $2 for 4lbs brown rice and got FREE organic products. Want to see how others save? 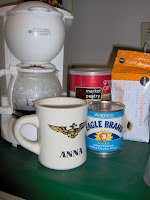 Check out Money Saving Mom, Coupon Saving Game, I Heart Publix and The Thrifty Mama. Welcome everyone! Today I have tea and zucchini bread. We have a lovely consignment thrift shop just down the road. That's where I found the teacup on the right. 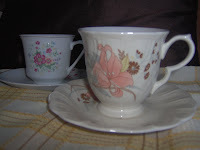 The one on the left is from a teacup exchange tea party two summers ago. It was a fun twist on a party. Bring your own teacup and simply leave with someone else's cup. This week is a blur. Most I remember is battling a computer virus. I was so frustrated I just left it alone for a few days. I didn't even want to touch the computer. Thank God for answered prayers. I went on google and followed a few suggestions and now it's fixed! Wow! I went out for coffee with a friend last night. Wish I could have taken all of you there. The kids were already tucked in bed hours before. Hubby was relaxing and hanging out with me before I left. I was ready to go with an hour to spare. Not rushing certainly makes for a better outing! Being with you gals last Friday made me realize just how much I miss my girlfriends. I saw many of them at our MOPs meeting. And don't you know, the topic was about taking care of yourself, including going out for girls' night. While I love big gatherings, my soul yearned for that quiet heart-to-heart, to be heard and cared for then return the favor. And that was the agenda. My friend and I had a sweet time of fellowship together. We're doing this more often! And I haven't forgotten my "pampering me" time. It's been on my mind all week. Thanks for all the comments, it's keeping me motivated! I plan to sneak in some bath time while the kids nap today. I still have new candles to try and lots of books on my reading list. Please try to get some "me time" too and let me know about it. We'll keep each other in check. Because we know if mama ain't happy... you better get out the chocolates! Join us every Friday at Home Sanctuary for Company Girl Coffee! Girlfriend time is such a fine thing that I'm linking this post to Finer Things Friday. Homemade Granola: Gems from the Pantry! Confession: I'm terrible about giving out recipes. My granola recipe was supposed to get passed along to a friend like years ago. She reminded me the other day. And I just happened to have Martha Stewart's February magazine opened to the recipe. Out of guilt I made a batch for to share with her and other moms at our MOPs meeting. Then it turns out, she needed a Granola Bar recipe! 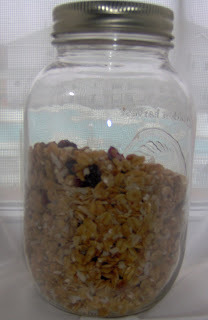 Granola is an easy frugal recipe I learned first from The Tightwad Gazette book. It can be very expensive if you use fancy ingredients. But at the basic level you just need oats, oil and sugar. It's the perfect way to use up baking items in your pantry. 2. Heat maple syrup, honey, sugar & oil in the microwave one minute to help the sugar dissolve. 3. In a large container, mix all ingredients except Craisins, raisins, & coconut. 4. Spread granola evenly in the biggest rimmed baking sheet you have (or baking pan). *I sprayed the pan with oil because I was paranoid about it sticking. 5. Bake for 30 mins. Take it out every 10 minutes to stir. The edges get crispy faster. 6. Add the raisins, Craisins and coconut. Cook 10-15 minutes more until crispy. Save any fruits or chocolate chips until the very end because they can burn quickly. You can also add pepitas (pumpkin seeds), nuts (pecans or walnuts), flax seeds, wheat germ, chocolate chips, and even dry milk powder. Also try other dried fruits like chopped apricots, dates, banana chips- basically whatever you have and like (or what healthy stuff your family would otherwise protest to eat). Inspired to whip out meals straight from the pantry? See all the recipes at Ultimate Recipe Swap! UPDATE: I did it! It's fixed. I'm not really sure what I did except that we just saved $200. So, if you ever run across this problem, remember the name of the program and google it. Follow the suggestions, and also read the comments to find other tips. This is my frugal tip for the day! I may not be able to post for a couple more days. My computer is infected with Antivirus Live. Good thing that I can work on the blog from another computer! So bear with me until I get it all cleaned up. On a side note, whenever there's been a problem with a virus, all I've had to do was google the name of the virus and find a step-by-step solution online. I've also downloaded a free software called Malwarebytes Anti-Malware. It's worked for most of the pests I've encountered. Except for this one. So we took the computer to Best Buy's Geek Squad. They were going to charge us $199! That's just crazy. If my computer was frozen and not turning on, yes I would pay that much. But they said it costs just $70 to diagnose the problem. They're worse than mechanics! But when we walked away, the nice young man suggested that we could always reboot the system back to factory settings. Which is what I will do. Thanks for the free advice. Best Buy, you're still on my good list. Frugal Fridays is a great weekly carnival to visit and learn some new tips on just about anything. So I couldn't help it. I went back to CVS tonight for more Physicians Formula. While there, I checked the endcaps and found more clearance items! After Qs, all this was only $1.75 (I didn't have the Thermacare Q). Thanks to Michelle & HCW for the coupon match-ups! Olay is practically giving away their products lately. It seems not too long ago I submitted for the FREE Olay Quench Lotion Rebate. And now, Olay Regenerist has a $15 Rebate. Get the 5oz at CVS for this crazy scenario. I just bought mine but used $1 off Qs. I'm going to see if I can return these and buy it back with the $3 Q that came out today. It didn't even cross my mind to check the paper first. I bought the paper in the same transaction! I'm very loyal to my CVS in Perdido and they usually work with me with returns. I am alway upfront and ask first if I can make changes. It never hurts to ask! When you make 2 friends, get 20% off your online or store purchase til tomorrow, Jan 18. Use code 94732 upon checkout. Thanks A Thrifty Mom! The closest store to Pensacola is at the Wharf in Orange Beach. While there, ask for a calendar. It has $5 off coupon and codes to use for your furry friend online at Build-A-Bearville. My kids were in awe of the whole process. But my daughter was given a make-at-home version. I told her that we had to make the one at home first. (This is $15 on Amazon.) And if it went on sale or there was a coupon then we could get the real deal... I guess it's about that time! 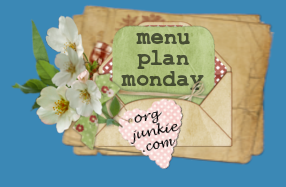 Visit Menu Plan Monday and get inspired to cook! The fridge is finally clean. It was not a pretty sight. But it's done. Hopefully, never to get that bad ever again. We'll try to eat mostly from the pantry again this week. There are several food rebates and deals I would like to do. So I'll be stocking up on weird stuff like peanuts (Kraft Jingle Rebate) and will need to appropriate my food budget accordingly. Next, I need to tackle the freezers. Then we'll see what we have on hand for a menu. Meanwhile, here is a recap of our meals this week. 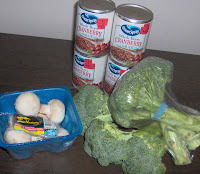 Our unexpected eat from the pantry week- I wanted to do a huge grocery shopping trip. 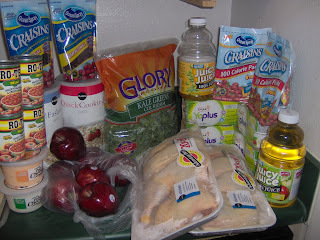 But after having to throw away an embarrassingly large amount of expired foods, I just couldn't make myself go shopping. I've been on a cooking funk and didn't want to end up buying stuff we won't eat. Looking at the pictures of what we ate, I guess we didn't fare so badly even though we just bought a little bit of groceries this week. I hope you enjoy this look at how we eat. And maybe get inspired to clean out your fridge and pantry. You never know how much money you'll save! Beef & Mushroom Stew. Didn't turn out like the Pioneer Woman's. I made a gravy for it. Nonetheless, it was so delish! The Meuller's whole wheat pasta tasted like regular pasta! I saved a few slivers of meat for Beef & Broccoli Stirfy for lunch. I cooked the last of Trader Joes Brown Rice Medley. It was so good I called Everman's to see if they have it... they don't. So, this week was Feast of Broccoli. We ate it so much. I bought 2 bunches at Target for $0.80 each after a Target Q. Their coupons for produce rock! 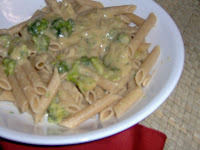 This dish is just Broccoli Cheese on pasta. I made it for the kids because there was no way they'd eat all those mushrooms in the beef stew. They loved it. I made alot of cheese sauce to use for baked potatoes stored in the freezer. Then my dear sweetheart husband ate 3/4 of the sauce. He "thought" it was cheddar soup. Needless to say we had enough sauce left for 3 potatoes. But I would make this again. It's so easy and filling, even if potatoes are supposed to be bad for you. This was deer meat- backstraps to be exact. A dear friend (couldn't help the pun!) gave us a few. It was so tender! Simply sauteed in butter & olive oil. I made pasta alfredo but this Ronzoni Healthy Harvest was awful, very wheaty. I added spaghetti sauce & it was fine! With the leftover awful pasta alfredo, I made a pasta version of Chicken Rice Broccoli. It straightened out left in the crockpot a few hours with some cream of chicken soup. I used mozzarella instead of cheddar. Ah, the experiments I do to avoid shopping at Wal-Mart. We came home late one night and I made these open-faced Ham & Egg Sandwiches on whole wheat egg muffins. Great combination. It's only open faced because there were just 4 pieces left! 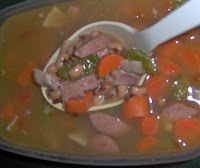 Last night, I made Black-Eyed Peas Soup with carrots, bacon and smoked beef sausage. No fresh onions, celery or parsley. I used dry spices instead. It worked just fine! I also made French Lentil Soup. The French lentils are smaller and don't get as mushy. I still want to make that Blueberry-Breakfast Strata but we're out of bread. I even considered making homemade bread. But who am I kidding? I didn't see many deals this week so this was going to be a short shopping trip. I was only looking for SoyJoy bars. They were not in last week. And I'm so glad they came in finally. You see, my hubby doesn't like these so I get to have them all for myself. Yay! Then I remembered that The Thrifty Mama said she found Physician's Formula make-up for 75% off at Rite Aid, even the 100% Organics. CVS has 75% clearance too! So my trip took a longer but exciting detour and I found LOTS of make-up on sale: Rimmel, L'Oreal, Revlon (not ringing up BOGO, though). The store manager says she always stocks up on make-up this time of the year. I'm coming back later to get some more. Paid $0.14 + tax using ECBs! *The store display says limit 3 but my receipt says limit 6. If you have lots of ECBs, this is the perfect time to roll them over before they expire. If you only have a few, then you can do multiple transactions. Buy the 1st for $6. Then use the $6 ECB that prints with your receipt for the next one. And keep paying for the next one with the $6 ECB that prints from the previous one. Just try to check out when no one is in line behind you. 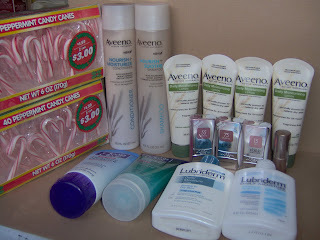 *If you still have $3 L'Oreal Qs, $2 Revlon Q's, then many of these items will be FREE! IheartCVS has Ad Scans and Coupon Match-Ups. IheartWAGS has Ad Scans and Coupon Match-Ups. Totally Target has Gift Card deals and a Sneak Peek. Sunday Coupon Preview has Smart Source & PG Coupon Inserts. Don't know where to look for coupons? Go to Hot Coupon World for their Coupon Database. Mall Shopping for Clearance Finds! Middle of January must be the time for major clearance for retailers. All the stores are having great sales! Even the mall is a good place to shop right now. Prudent Patron has assembled a cast of mall coupons. Thanks! I'm going to have to start saving up for January shopping next year. 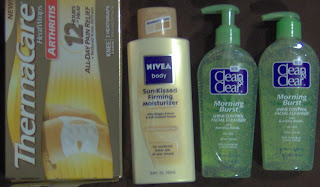 I'm thinking of grabbing some clearance items at Bath & Body to get the FREE travel size items. I've heard from Hip2Save Comments that there are lots of 75-90% off! Old Navy has lots of deals too. I was able to print a $10 off $50 and a 10% off purchase coupons by using 2 email addresses. If these were the super high value coupons like $50 off $100 then I wouldn't because those are really hard to get. Anyway, go to Old Navy Weekly and get the $10 Q by moving the blue shirt under the green one. Get the 10% off Q by placing the green headband to the girl with black hair on the right. View the Winn-Dixie Ad to see more deals. I also heard (can't remember now who said it, sorry!) that if you shop early during the week at Winn-Dixie and buy even just one of the items from the sales ad, you might get a $10 off $50. I will try it this Sunday/Monday and let you know if it works! If I get the Q, I'm heading off to Publix to do the rest of my shopping! Get 100 Labels for Education Bonus Points from Jan 13-Feb 2 2010. Buy any 5 Labels for Education participating products in one transaction. Use your Winn-Dixie card. View the Greer's Sales Ad for more deals. I started my shopping week with CVS. Lots of Bonus buy items are printing ECBs (CVS Qs) but they are not very good deals, unless you have an EBT card, which I did. So, I always try to leave extra money in there for food deals that will get me store coupons or gift cards I can use for non-food items like toilet paper. All this added up to $30. Then I got $13 ECBs back. I also grabbed the GE Reveal for cheap with Qs and ECBs. 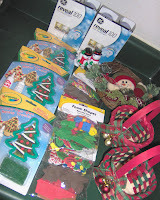 Then I used up $10 ECBs for these 75% off Christmas items. Paid nothing out-of-pocket! 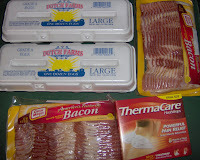 Hubby bought these at Walgreens instead of Wal-mart because of the RR deal for the bacon. Eggs were $0.99 and Thermacare is FREE after RRs. For a 2nd Walgreens trip, I came away with $64 worth for only $3 + tax! Plus I'm submitting for the Johnson & Johnson $10 Rebate. So, this trip is a moneymaker! Target, as I mentioned, had lots of toy and clothes clearance. But I did manage to find some grocery deals. The broccoli was only $0.79 each after $1 Target Q. And the OS Cranberry sauce is only $0.68 (doesn't expire til 2011!) 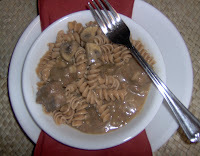 The mushrooms were only $1.49 and were great in the beef & mushroom stew I made this week. Total was $5.70 for all. I also did the Sobe $5 GC deal twice. So, for 20 Sobe, it was $20 plus $10 Target GC. (I paid with my EBT card, otherwise I wouldn't do this deal.) I used this GC to get a Barbie doll for FREE! Of course, I couldn't help but go back for even more toys. And while there, bought some food to avoid going to Wal-Mart. I don't know about you, but I am just not in the mood to cook or grocery shop! Anyway, the prices at our Target are almost the same at Wal-Mart. The only Q I had was for Activia- $0.97 after a $1 Q. Get inspired or share your savings stories: visit MSM, IHeartPublix, TTM, CSG. Since the holidays, I haven't really gone shopping but one time. 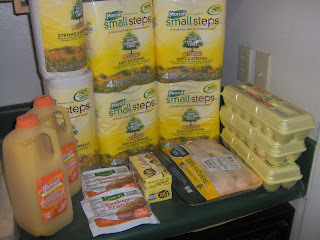 Starting January, I was all set to join Money Saving Mom in the Pantry Challenge. I didn't get my stuff together, though. But in the spirit of the challenge, we've been eating mostly from the pantry. Our Target in Pensacola still has lots of toys for 75% off. Some Barbies are still 50% off. I'm assuming that by Monday everything will be 75% off. 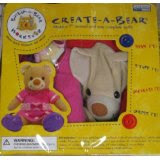 Lots of baby toys are also in the regular toy section. Magic Chef Ovens are 75% off too. So, if you have time and leftover Christmas money, head over there and see what you can snag! I'll post pictures of what I bought later. Also, I read that Old Navy has lots of 75% off clearance. Reading from the Hip2Save comments, you can also use a coupon from the Old Navy Weekly site on top of the clearance. How fitting it was back then. So it is again. Seeing all the photos of the Haiti has brought back memories of my own earthquake experience in the Philippines. A 7.7 magnitude earthquake hit northern Luzon in 1990. I was in 5th grade and sitting with friends on the second story terrace of our school. I felt dizzy as I got up and saw the roof of the guard house shaking. Then I knew an earthquake hit and not a headache. The teachers gathered us in the courtyard. Everyone was crying around me but somehow I felt peace. School quickly dismissed. All the buses were inoperable as the roads were turned up and cracked by the quake. So, a few of us walked home together. We walked for at least two hours looking up at the buildings with cracked walls and smashed windowpanes, broken glass everywhere. I didn't know how far-reaching earthquakes were at 11 years old. It surprised me that my own street, miles away, had so much damage. Thankfully, our building was okay and so was my mom. But not so in the northern region of Baguio where just a few years we had our first family vacation. This beautiful area was now littered with buildings that had fallen down. They looked like smashed loaves of sliced bread to me. I can never forget that experience. 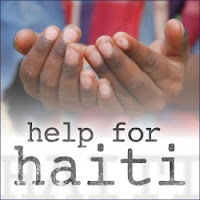 Like many of you, I am praying for the people of Haiti, especially the children. I feel like their minds are too young to be exposed to all this destruction. But as I experienced then, they too can feel God's peace. He will cradle their spirit. If you can help, I urge you to do so. And prayer is not the least you can do. Your prayers will reach the ears of God and help more than you think. I'm loving having you over for coffee! In college, my roommates were Vietnamese and loved to drink iced coffee: strong black coffee plus sweetened condensed milk poured over a glass of ice. So yummy! I prefer no ice while it's still winter. The highlight of my week was getting the kids to bed by 7pm and taking a nice long bath. I don't remember the last time I soaked and read a book uninterrupted. I plan to fit that in my weekly schedule! We started back up yesterday with our homeschool co-op group. In preschool art, the kids read snowy days storybooks. 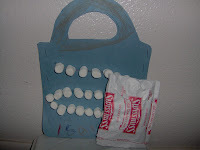 For craft, they made this cute paper bag decked with marshmallows. Using the stapler was hands-down their favorite part! Who would have thought? The rest of the week is a blur to me, mainly because of all the cleaning and shopping that had to be done. With the weekend underway, I'm looking forward to catching up on blogging and maybe some sewing. There's a lot of tulle calling out to me! Wondering what being a Company Girl is all about? Visit Home Sanctuary or see all the Coffee links this week to learn more. It's great fun, I hope you'll join us. Some reaader have reported at Hip2Save that their Walgreens are offering BOGO for Aveeno, Clean & Clear and Lubriderm. So, I was going by Cordova Mall and called the Walgreens there. They said theirs was only BOG1/2. We have a bunch of errands to do and somehow never got around to Walgreens. But on the way home, we passed by the Walgreens off Saufley Field and Mobile Hwy and theirs is BOGO! How 2 stores not 10 miles from each other can have completely different promotion is just insane to me. But I'm sure glad for it! Total Paid: $4.15! I will try to submit this for the Johnson & Johnson's $10 Rebate. 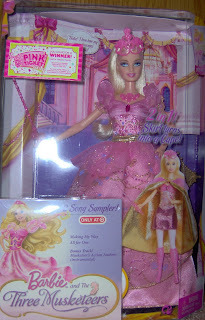 $5 Barbie Coupon or Prize! Hey all! Target has many toys, including Barbie, for 75% or 50% off. We bought a Barbie Three Musketeers doll for $9.50! This is a Pink Ticket Party item. So with the code we got a $5 off coupon and a FREE Barbie or Barbie Furniture! Check your Target or Wal-Mart for clearance items because you could be a winner too. Hurry, the codes can only be redeemed through January 30, 2010! See the Food World ad for more deals. 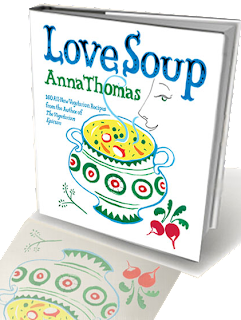 When I saw this book, I was inspired to try some recipes from cooks who have made it big and got their cookbooks published. So you'll find links below. I can't wait to get cooking! Some of you who know me personally might understand why I particularly like the sound of this book: Love Song! We'll see what I actually end up making... I just picked whatever grabbed my eye. Except for the Blueberry Breakfast Strata. I wanted to make that when I saw the video. I miss having breakfast for dinner besides cereal at night! This week will have a Smart Source and a Redplum insert. 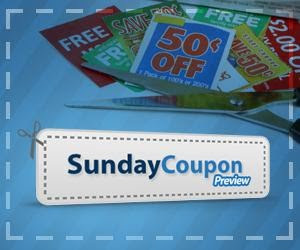 Bookmark Sunday Coupon Preview page if you haven't already. I love finding out about coupons ahead of time so I know whether to get more than one! I'll get mine at CVS to use up my ECBs but you can buy them at Wal-Mart or the Dollar Tree for $1. I've seen newspaper people at Wal-Mart on Sundays. So watch out at yours. They gave me a free paper last with 5 coupon inserts there! Yay! Plus they are offering $1 Sunday subscription. We did this before and it was great to have the paper delivered to you. The only problem was that when we didn't want to renew, it took a few weeks for them to stop sending the paper and a few phone calls to clear up the matter. So prepare for that! Since early this morning, I've been writing off and on, both blogging and journaling. Then I hit a writer's block. For some reason, I thought about Rita Springer and her music. Rita's myspace page has some favorites like "I Have to Believe" if you want to hear too. And it worked! I was deep in thought again. My mind and hands made a connection and below is what I wrote. Thanks Rita! For so long, I felt like I had to get my quiet time in my serene space to commune with God. I had to get to Him. Somehow I missed out on the part that He’s not that far that I have to get to Him. He’s right here next to me. As I cut my coupons, write my shopping lists, prepare menus, I’m already in the perfect position to pray and talk to Him. To make myself vulnerable and pour out my feelings about being a mom, these are things I need to voice that He’s been waiting to hear. I think that words like “devotionals” & “quiet time" restrict & idealize our relationship with God. When I wake-up startled by my son standing in front of me asking about breakfast, I’m not really thinking about having quiet time with the Lord. It’s more like, “Nooo… not this already!” The day goes on. I hear God calling me to sit with Him & I can't ever find the time. Because I'm thinking that it has to be like I’m meeting a friend at a coffee shop. But I don’t have to even get out of my pajamas or brush my teeth because He is already right next to me. I often talk about how my faith grew because of clipping coupons. More out of a desperately small budget than anything, I had to pray about everything concerning grocery shopping. I knew very little and didn’t know anyone else to turn to. Week by week, I saw God answer my prayers in tangible ways. Every time I opened the cupboards and fridge I was reminded of how He provided those sales and coupons, sometimes, as if just for my specific needs. Seven years later, here I am forgetting that these times of sincere prayer were the best "devotionals" I’ve ever had. When we surrender to Him this very thing we find mundane and allow Him to invade our daily lives, that is when we will see Him. It’s about God in the everyday, still miraculous, still awesome. My favorite romantic comedy movie is It Happened One Night with Clark Gable and Claudette Colbert . There’s a scene where they stopped for the night at some cabins. For breakfast, he prepares one egg, black coffee and two donuts. It got me thinking this morning about portion sizes back then and now. Because we only have two eggs left ourselves to split amongst 4 people. (You see, I was waiting for a sale on eggs so I kept delaying buying some. Walgreens will have them for $0.99 starting Sunday. I'll price-match at Target or Walmart since they’re closer to me.) I asked a MOPs mentor mom for healthy eating tips and she suggested trying to only eat what the serving size says on the box. Then wait 10 minutes and eat a little bit more if you’re still hungry. So, I had one waffle plus half an egg and bits of sausage. Instead of free-pouring the syrup, I poured ½ cup in a measuring cup and served everyone’s waffles out of that. There’s some left and everyone is happy. I make a fruit compote but we're out of frozen fruits except bananas. I used the last box of free Kashi Waffles today. I think Target no longer carries these. But another great deal will come. Or I'll just have to make homemade again. It was nice to have a break from cooking since it was healthier and free to get these. The syrup is surely a splurge at $7 for the bottle at Walmart. I’m sure Sam’s has better deals. I’ve been eyeing this bottle for a long time. Starting this year, we'll celebrate our grocery savings by buying healthier items we otherwise could not afford. Sometimes, you just have to live it up. Free waffles = extra money = pricey syrup.